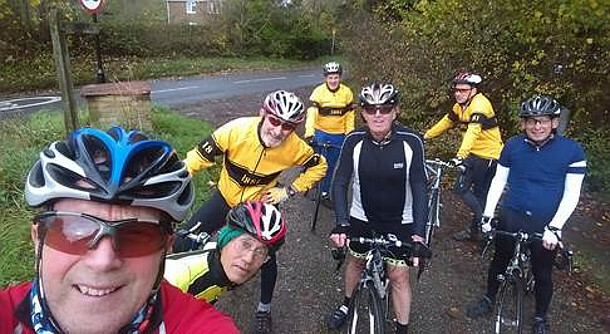 Sunday saw the annual Anerley BC downhill competition, 7 of the Anerley faithful turned out, including Yoshi who is soon to head home to the land of his fathers. Back to the downhill this tears winner was Miles (on his first attempt), second place went to Jeremy (who was glad to get the trophy off his mantle piece) and in third place was another newish boy David. The hump beat the rest of the gang. 11’s was at the Redhill aerodrome café, now a couple of portacabins following the fire. The rock cakes were still as good. The rain came on as the group headed home, 34 miles not bad for a grey Sunday morning. Above is the group’s attempt at a selfie!! !